Think you know every college out there? Think again. Here are some diamonds in the rough from The Keystone State. Allegheny College (Meadville, PA): A liberal arts college in picturesque western Pennsylvania, Allegheny aims to better prepare its students for an interdisciplinary world by offering an innovative curriculum in which students must major and minor in two somewhat unrelated fields (i.e., not chemistry and biology but chemistry and philosophy). Chestnut Hill College (Philadelphia, PA): A small, nurturing, Catholic liberal arts college located in a historic neighborhood of Philadelphia, Chestnut Hill offers many interesting combined programs as well as a particularly solid elementary education program. This is an environment where formerly reticent students "come out of their shells" and thrive socially. Immaculata University (Immaculata, PA): Immaculata features a faculty invested in student learning and success, a curriculum embedded with programs to provide academic support, and a beautiful campus near Philadelphia. Juniata College (Huntingdon, PA): Central Pennsylvania's Juniata College has created a unique system of advisement to help students make the most of their college experience. In January of freshmen year, every student chooses two faculty advisors: a program advisor to assist with issues related to the student's program of emphasis matters and a general advisor to deal with broader academic issues. Lebanon Valley College (Annville, PA): With its friendly environment and approachable professors, Lebanon Valley is a very viable option for students who need a second chance. Millersville University of Pennsylvania (Millersville, PA): One of 14 Pennsylvania State System of Higher Education (PASSHE) colleges, Millersville is located in historic Lancaster and provides great value for both in-state and out-of-state students. 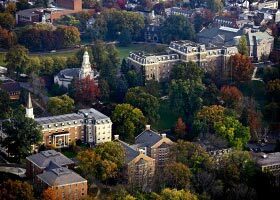 Muhlenberg College (Allentown, PA): A small college only an hour's drive from Philadelphia, Muhlenberg offers robust academic options and lively social life. York College of Pennsylvania (York, PA): York is a private liberal arts college experience with a public school price and a direct admit nursing program.